Federation Command does not take matters of inter-galactic relations lightly. Our alliances and treaties tend to reflect what we consider to be in the best interests of the fleet, and not based on personal feelings of affection for others. However, despite the aforementioned, we believe that diplomacy should be highly sought after and developed, and that our alliances hold for legitimate and valid reasons. Protectorate Pact (PP) - We will offer this pact to any fleet who we feel is being poorly treated by another, or who cannot sustain themselves without help and we shall provide it. We only offer these pacts to Fleets we consider worthy of protecting and are on good terms with FC, and only where FC's other commitments and arrangements do not interfere. This pact, once accepted, is a one sided defense arrangement in which the FC will provide military and political protection to the protectorate. We ask for no remuneration, this is our duty to the community. Visiting Fleets who apply for this form of pact are generally ignored for this is not a bodyguard service. Intervention Pact (IP)/War Alliance - FC and other signatories shall agree to intervene in a military and/or political arena if a certain condition is breached. 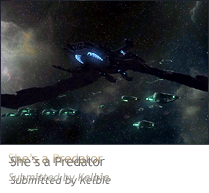 For instance, if Fleet A is invaded by Fleet B, IP Pact Fleets C, D and E will engage Fleet B. This form of pact is a political pact and is used to defer war by proving its futility through show of strength. This pact can either be made publically or secretly. Non-Agression Pact (NAP) - This is a pact of recognition that the involved clans are in a pact together. This is a sign that the involved clans will have some respect for each other when gaming or in contact with each other. This does not guarantee support in any wars. This treaty will remain in effect untill either side breaks the pact. A request can be made to be released from this pact. Mutual Protection Pact (MPP) - This is FC's NATO style alliance pact. For all practical reasons a MPP is to be considered an alliance. This pact brings together the signatories against an external agressor who starts military action against one of the signatories. This means that both signatories would provide support in the areas of logistics, professional soldiers, and intelligence that is relevant to the war effort if requested by either side. Alliance - This pact guarantees that the Federation shall support another organization during times of war, defensive or not, and vice versa. FC rarely enters this form of pact even with its closest friends due to the "blank cheque" nature of this alliance. In the event that an alliance holder of the Federation enters into a conflict with another entity, it is expected that their leaders would privately inform the Diplomacy CO, a FC Councillor or the Executive Committee of Federation Command immediately. Upon notification, Federation Command would contribute to the war effort by providing assistance in the matters of intelligence and logistics. Military intervention on behalf of the Federation would occur when the Admiral's Council has decided upon a wise course of action and has formulated a strategy to guarantee that Federation Command and her ally will emerge victorious. Neutral - This is our default relation status with any new or existing clan or fleet unless otherwise stated. Enemy - You are listed as an enemy of FC. We will not have relations with you and we are probably at war with you. Any fleet wishing to seek relations with the Federation Command must have a minimum of five officers. You must not be at war with any other fleet that we hold a pact with, doing so immediately disqualifies you from becoming a pact holder. As a sign of the allegiance, both parties must display the appropriate condition status on their web sites regarding the pact, as well as a link to that fleets home page. By applying for a merger, you automatically agree to become a subordinate body of Federation Command, and as such the maximum rank achievable by any level of officer during the exchange is Commodore (which is usually reserved for the Fleet CO), with the majority of the members receiving either Ensign or Lieutenant Junior Grade. It is important for your officers not to dispute the ranks given, we prefer a pyramid-like chain of command for efficient running. All awards an officer in the merging fleet has are not convertible to Federation Command equivalent, unless agreed to before hand. No command spot is guaranteed, unless pre-arranged. Fleet CO and XO spot is non-exchangeable during any merger, as well as the clan name, it is expected that the fleet applying for a merger is willing to adapt to and accept our culture. Once the merger has taken place, it can not be revoked by either side. Any officer attempting to disrupt the integration process shall be thrown out of the Fleet, and banned. We hope that any fleet applying for a merger is doing so for the benefit of their membership, and have already taken measures to prepare their officers for the fact that they can face serious reductions in rank. FC has four fleet-wide condition status levels which we use to best organise the Fleet depending on the state of relations with other clans. The condition status is chosen by the Executive Committee or the Council of Admirals. Our website home page lists our current status in the left column. Condition Green signifies a "normal" risk of attack. Starfleet Officers of all fleets are to carry out standard patrol duties. This is the preferred condition status for diplomatic relations building. Condition Yellow signifies a heightened risk of attack. The Starfleet Marines are ordered to raise shields and prepare for imminent conflict, and the rest of the Fleet is placed on stand by and advised to be vigulent. Diplomacy is instructed to make clear FC's stance during this period and keep the Fleet up to date. An enemy attack appears imminent or has begun. Condition red requires the war protocol to be put into immediate effect. Starfleet Security is instructed to complete Condition Red objectives to lockdown the fleet against cyber attacks. Diplomacy is instructed to keep the Fleet up to date with developments on the military front and to keep our allies informed of our progress. War is looming or has begun, and we are ready for it. This is our special alert status for unique times of inactivity (e.g. Christmas/New Years). FC is placed into a state of community isolation, all Diplomacy treaty obligations are temporarily suspended and foreign relations are put on hold. FC is temporarily placed in hibernation mode. All officers are automatically granted leave but are free to continue their normal duties.